The Aztecs were a Pre-Columbian Mesoamerican people of central Mexico in the 14th, 15th and 16th centuries. They called themselves Mexica. The Republic of Mexico and its capital, Mexico City, derive their names from the word "Mexica". The capital of the Aztec empire was Tenochtitlan, built on raised island in Lake Texcoco. Mexico City is built on the ruins of Tenochtitlan. The Spanish colonization of the Americas reached the mainland during the reign of Huey Tlatoani , Moctezuma II (Montezuma II). In 1521 Hernan Cortes and an allied army of American Indians that far outnumbered the defending Aztecs, conquered the Aztecs through germ warfare, siege warfare, psychological warfare, and direct combat. According to their own history, when the Mexicas arrived in the Anahuac valley (Valley of Mexico) around Lake Texcoco, the groups living there considered them uncivilized. The Mexicas borrowed much of their culture from the ancient Toltec whom they seem to have at least partially confused with the more ancient civilization of Teotihuacan. To the Mexicas, the Toltecs were the originators of all culture; "Toltecayotl" was a synonym for culture. Mexica legends identify the Toltecs and the cult of Quetzalcoatl with the mythical city of Tollan, which they also identified with the more ancient Teotihuacan. The center of the Aztec civilization was the Valley of Mexico, a huge, oval basin about 7,500 feet above sea level. The Aztec empire included many cities and towns, especially in the Valley of Mexico. The largest city in the empire was the capital, Tenochtitlan. The early settlers built log rafts, then covered them with mud and planted seeds to create roots and develop more solid land for building homes in this marshy land. Canals were also cut out through the marsh so that a typical Aztec home had its back to a canal with a canoe tied at the door. The story of the Aztecs' rise to power is awe inspiring one, and is one of the most remarkable stories in world history. They were a relatively unknown group of people who came into the Valley of Mexico during the 12th and 13th century A.D., and rose to be the greatest power in the Americas by the time the Spaniards arrived, in the 16th century. Little is known of the earliest Aztecs, they did not keep a written record. Their history was passed on by word of mouth from one generation to the next. Legend has it that they came from an Island called Aztlan, meaning White Place - Place of Herons. 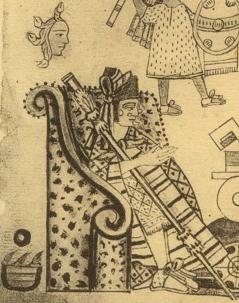 In the Aztec codex Tira de la Peregrinacion, commonly called the Migration Scrolls. The scrolls have the Aztecs leaving Aztlan, which was described as an island in a lake with Chicomoztoc depicted as seven temples in the center of the island. The Aztecs felt they were the "chosen people" of Huitzilopochtli. The Aztecs believed Huitzilopochtli their war god was their protector, how had them search for their promised land. Sometime during the 12th & 13th century the Aztecs straggled into the Valley of Mexico, led by their chieftain Tenoch. They were a poor, ragged people who survived on vermin, snakes, and stolen food. They were hatred and rejected by all the surrounding inhabitants of the valley, for their barbarous and uncultured habits. They were driven from one location to another. Early in the 14th century, Huitzilopochtli told Tenoch to lead his people to a place of refuge on a swampy island in Lake Texcoco. When they reached their destination, they were to look for an eagle perched on a cactus, growing from a rock or cave surrounded by water. At that location, they were to build their city and honor Huitzilopochtli with human sacrifices. The city they built was called Tenochtitlan, the city of Tenoch. 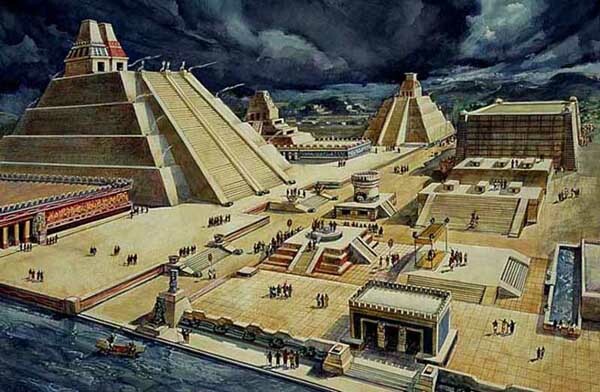 In the beginning stages of Tenochtitlan, development, Aztec life was very difficult in their undesirable location. Tenochtitlan was located on a marshy island with limited resources, they built a few thatch and mud huts, and some small temples. The Aztecs would have to work constantly to maintain a city on swampy land. There was also continuing tensions between the Aztecs and the neighboring peoples on the mainland who despised them. Despite these obstacles, the Aztecs worked hard to improve the quality of their lives. They adopted an agricultural system of farming called the Chinampas. and in a short period of time, the land was transformed into a fertile and highly productive island. As the Aztec empire expanded, specialized craftsmen and common laborers were brought to Tenochtitlan to expand the city. Since it was built on swamp land, large wooden stakes were driven into the soft ground to provide secure foundations for the new buildings. They were able to use the stone Tezontli to construct the buildings on the unstable ground. Despite these precautions, the larger temples and palaces would often sink below ground level. As a result, the older building were continuously repaired or rebuilt with the newer structures built over the older core. By 1376, the Aztecs knew that they had to select a emperor of royal lineage, to gain respect of their neighbors. With political genius, they chose a man by the name of Acamapichtli as their emperor. He was related to the last rulers of Culhuacan, and his lineage extended back in time to the great Toltec ruler Quetzalcoatl. 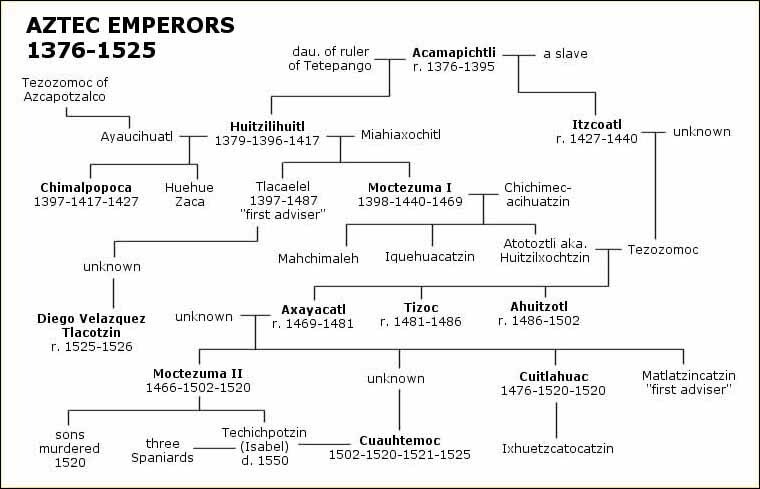 With the selection of Acamapichtli as the Aztecs first true emperor, their were able to claim descendancy from the great Toltecs. During the 15th century the military strength of the Aztecs increased. They grew from a small tribe of mercenaries into a powerful and highly disciplined military force. They also formed alliances with their powerful neighbors Texcoco and Tacuba, known as the Triple Alliance. 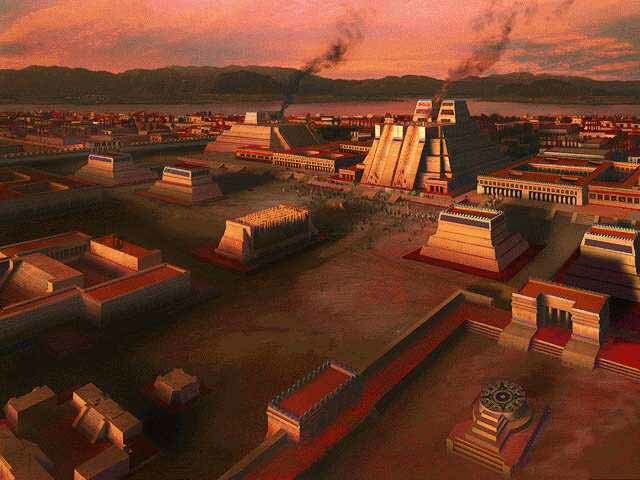 It was a time for building and the city Tenochtitlan grow and prospered. By the end of Tenochtitlans rule, in 1520, 38 conquered tributary provinces had been made, who had to make payments. However, some of the tribes at the borders stayed strongly independent. This made it easy for the Spanish captain, Cortez to defeat them. The priests reported signs of doom, but Montezuma, the Aztec ruler, thought Cortez was a returning god. When the Spanish saw the gold presents Montezuma offered to them as presents, they wanted to conquer the city. The Spanish defeated the Aztecs and the Catholics felt that it was their duty to destroy every trace of the Aztecs. The few Aztecs that remain have carried on their culture today. Sometimes also includes the inhabitants of Tenochtitlan's two principal allied city-states, the Acolhuas of Texcoco and the Tepanecs of Tlacopan, who together with the Mexica formed the Aztec Triple Alliance which has also become known as the "Aztec Empire". In other contexts it may refer to all the various city states and their peoples, who shared large parts of their ethnic history as well as many important cultural traits with the Mexica, Acolhua and Tepanecs, and who like them, also spoke the Nahuatl language. In this meaning it is possible to talk about an Aztec civilization including all the particular cultural patterns common for the Nahuatl speaking peoples of the late postclassic period in Mesoamerica. In 1521, in what is probably the most widely known episode in the Spanish colonization of the Americas, Hernan Cortes, along with a large number of Nahuatl speaking indigenous allies, conquered Tenochtitlan and defeated the Aztec Triple Alliance under the leadership of Hueyi Tlatoani Moctezuma II; In the series of events often referred to as "The Fall of the Aztec Empire". Subsequently the Spanish founded the new settlement of Mexico City on the site of the ruined Aztec capital. The capital city of the Aztec empire was Tenochtitlan, now the site of modern-day Mexico City. Built on a series of islets in Lake Texcoco, the city plan was based on a symmetrical layout that was divided into four city sections called campans. The city was interlaced with canals which were useful for transportation. Tenochtitlan was built according to a fixed plan and centered on the ritual precinct, where the Great Pyramid of Tenochtitlan rose 50 m above the city. Houses were made of wood and loam, roofs were made of reed, although pyramids, temples and palaces were generally made of stone. Around the island, chinampa beds were used to grow foodstuffs as well as, over time, to increase the size of the island. Chinampas, misnamed "floating gardens", were long raised plant beds set upon the shallow lake bottom. They were a very efficient agricultural system and could provide up to seven crops a year. On the basis of current chinampa yields, it has been estimated that 1 hectare of chinampa would feed 20 individuals and 9,000 hectares of chinampas could feed 180,000. Anthropologist Eduardo Noguera estimates the population at 200,000 based in the house count and merging the population of Tlatelolco (once an independent city, but later became a suburb of Tenochtitlan). If one includes the surrounding islets and shores surrounding Lake Texcoco, estimates range from 300,000 to 700,000 inhabitants. The Aztec civilization contained about 15 million people that lived in nearly 500 towns and cities. About 300,000 people lived in Tenochtitlan. In this famous city, the government controlled and were responsible to deal with taxes, punishment, famine, and market trading. Punishment in the city of Tenochtitlan was enforced for breaking any of the code of government laws. Offenders were enslaved into tedious work conditions for a specific amount of time. If the offense happened to be minor, the law-breaker was charged with a string of fees or fines. This type of governing system is only one of the many things that affected aspects of everyday life for the Aztecs. The city of Tenochtitlan was truly magnificient. Its crime rate was extremely low, and it was almost impossible to find waste in the city. The city's inhabitants were smart, and loyal to the city. The structures were amazing, including the Main Temple, the Great Pyramid, and many famous palaces. The Aztecs worked around things that were hard to come by, like food. Instead they maintained other jobs and traded with foreign countries. Everything about Tenochtitlan was wonderful, and the city stands out as one of the greatest empire of all time. Tenochtitlan was founded in a fascinating way. Supposedly, the myth behind the founding of Tenochtitlan: Huitzilopochtli (the God of the Aztecs) told one of the leaders in a dream, "When you followed my orders and killed my nephew Capil and ripped out his heart, and threw it away into the lake, the heart fell on a stone, and from this stone out grew a napal cactus and on this an eagle is now perched. There you will establish a city named Tenochtitlan". The leader listened to Huitzilipochtli, and followed through with his orders in Anno Domini 1325. The reason behind naming the city Tenochtitlan was that it meant the place of rock and nopal. The heart of Capil landed on a rock, where a nopal grew; "nochtli" means nopal. This leader, his name unknown, followed his god's command, despite this area being one of the worst pieces of lan in Mexico. Tenochitlan was built where Mexico City now stands, and the land was marshy and snake-infested, the little amount that there was. 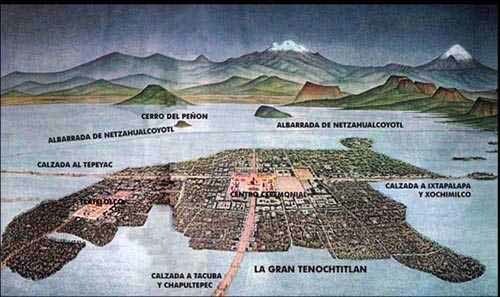 At first, Tenochtitlan's position was on two islands, yet over short periods of time it extended to the lake circling it by way of building docks attached to the isles by peers, and building settlements on these docks over Lake Texcoco. Though it wasn't the best land around, this leader designed the city to perfection. There were four huge dikes all going out from the center of the city to separate docks and small islands. These four dikes made up four quadrants in the city. Each of the quadrants contains housing developments, and what were known as "floating gardens". The houses were painted white with adobe roofs. The reason the houses were painted white was so the light would reflect of them and keep the inhabitants living in the house cool. The houses were also packed tightly together to make the only time when the sun would beam down on them high noon. The floating gardens were important to Tenochtitlan because there was so little land to farm on. 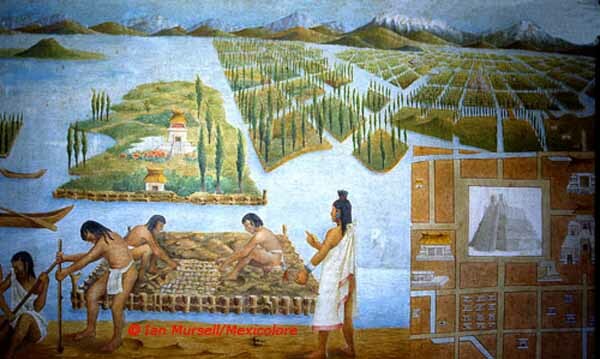 The inhabitants of Tenochtitlan used irrigation to grow crops throughout the year and made "floating gardens" by filling shallow areas of the lake and anchoring the soil with trees. The floating gardens were a great success, and also added to the beauty of the city. Tenochtitlan was probably one of, if not the best designed city in the world, and the center of the city proved this true. The center of Tenochtitlan was made up of many temples, the most important one being the Main Temple, palaces, pyramids, and a great plaza. The center was roughly five-hundred and fifty square yards, but seemed much bigger because everything was packed so tightly together. There were close to a dozen temples in the center, but the most important one was the Main Temple. The Main Temple was dedicated to rain god Tlaloc and sun god Huitzilopochtli, whom the Aztecs considered their protector. The Main Temple was a large temple, which words could not describe. It was free of any sort of litter and had an incredibly tall wall in which another city could be constructed. It was important to the Aztecs of Tenochtitlan, and they worshiped daily in it. There were also many palaces and pyramids. The palaces were dedicated to the kings and nobles, and the pyramids were made for sacrifices. The Aztecs of Tenochtitlan though it necessary to nourish the deities with human hearts, because if not, then the sun would not come up daily, or there would be an enormous drought. The people mostly used prisoners of war for their sacrifices. The main place of sacrifice was the Great Pyramid. It had one-hundred and fourteen steps, and added to the magnificent beauty of the city. The Plaza was in the dead center of the city, and was whitewashed. It had no litter whatsoever, and great walls surrounding it. The Plaza and all of these structures make the center look like a thing of beauty. The inhabitants of Tenochtitlan were what probably made Tenochtitlan the great empire that it is remembered as today. Tenochtitlan was spread out over 26,400 feet, and held over 400,000 inhabitants. That is the largest population density ever recorded in Meso-American history. All of the inhabitants of Tenochtitlan were Aztecs, and had the same culture and religion. They were all polytheistic, believing in many gods. The most important one to them was Huitzilopochtli, the god of the sun. 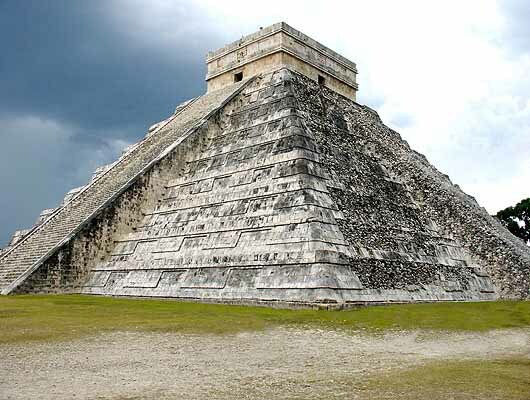 The Aztecs worshiped him daily in the Main Temple. 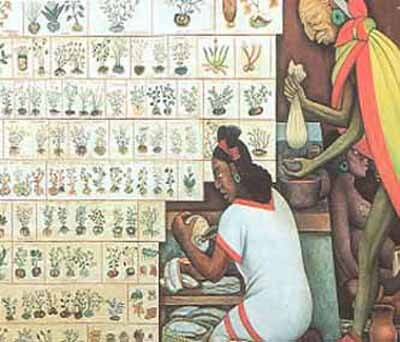 Since the land was not a great place to grow crops, the Aztecs were forced to work around this fact, which they did very well. Most of the citizens who lived in Tenochtitlan held jobs which were not associated with food. The residents of the metropolis made crafts, preached their religion, traded with other civilizations, or became part of the government. The Spaniards and other nations were amazed with the sheer quality of the city and its residents, so therefore traded much with them. The Aztecs received nearly all of their food from foreign trade. The Aztecs were a magnificent race of people who preserved Tenochtitlan for over two-hundred years. Many things were responsible for the fall of Tenochtitlan. The three main causes were repeated attacks by Cortes, a great famine that resulted from a decline in foreign trade, and many diseases carried over by the Euoropeans. Tenochtitlan was well protected by Lake Texcoco, but Cortes and his army were just too strong. The city fell in AD 1540, and Cortes destroyed the city. He built over it what is now known as Mexico City. Although the city itself was destroyed, the memories and sheer beauty of the city will remain forever. The empire reached its height during Ahuitzotl's reign in 1486-1502. His successor, Motehcuzoma Xocoyotzin (better known as Moctezuma II or Montezuma), had been Hueyi Tlatoani for 17 years when the Spaniards, led by Hernan Cortes, landed on the Gulf Coast in the spring of 1519. Despite some early battles between the two, Cortes allied himself with the Aztecs' long-time enemy, the Confederacy of Tlaxcala, and arrived at the gates of Tenochtitlan on November 8, 1519. The Spaniards and their Tlaxcallan allies became increasingly dangerous and unwelcome guests in the capital city. In June, 1520, hostilities broke out, culminating in the massacre in the Main Temple and the death of Moctezuma II. The Spaniards fled the town on July 1, an episode later characterized as La Noche Triste (the Sad Night). They and their native allies returned in the spring of 1521 to lay siege to Tenochtitlan, a battle that ended on August 13 with the destruction of the city. During this period the now crumbling empire went through a rapid line of ruler succession. After the death of Moctezuma II, the empire fell into the hands of severely weakened emperors, such as Cuitlahuac, before eventually being ruled by puppet rulers, such as Andres de Tapia Motelchiuh, installed by the Spanish. The Tlaxcalans remained loyal to their Spanish friends and were allowed to come on other conquests with Cortes and his men. The pre-conquest Aztecs were an empire that prospered agriculturally, and they did so without the wheel or domestic beasts of burden. They had four main methods of agriculture that were quite successful. The earliest, most basic form of agriculture implemented by the Aztecs is known as rainfall cultivation. The Aztecs also implemented terrace agriculture in hilly areas, or areas that could not be used for normal farming. Terracing allowed for an increased soil depth and impeded soil erosion. The terraces were built by piling up a wall of stones parallel to the contour of the hillside. Dirt was then filled in, creating viable, flat farmland. There were three types of terrace agriculture, each one used for specific circumstances. The three types were; hillslope contour terraces (steeper slopes), semi-terraces (gentle slopes, walls were made with Maguey plants rather than stones), and cross-channel terraces. Terracing was used mostly in the highlands of the Aztec empire. In the valleys of the empire, irrigation farming was used. Dams diverted water from natural springs to the fields. This allowed for harvests to be successful on a regular basis. The prosperity of a field was not dependent upon the rain. Irrigation systems had been in place long before the Aztecs. However, they built canal systems that were longer and much more elaborate than any previous irrigation systems. They even managed to divert a large portion of the Cuauhtitlan River to provide irrigation to large areas of fields. The network of canals was a very complex and intricate system. In the swampy regions along Lake Xochimilco, the Aztecs implemented yet another method of crop cultivation. They built what are called chinampas. Chinampas are areas of raised land, created from alternating layers of mud from the bottom of the lake, and plant matter/other vegetation. These 'raised beds' were between 2 and 4 meters wide, and 20 to 40 meters long. They rose about 1 meter above the surface of the water, and were separated by narrow canals, which allowed farmers to move between them by canoe. The chinampas were extremely fertile pieces of land, and yielded, on average, seven crops annually. In order to plant on them, farmers first created 'seedbeds,' or reed rafts, where they planted seeds and allowed them to germinate. Once they had, they were re-planted in the chinampas. This cut the growing time down considerably. Song and poetry were highly regarded; there were presentations and poetry contests at most of the Aztec festivals. There were also dramatic presentations that included players, musicians and acrobats. Poetry was the only occupation worthy of an Aztec warrior in times of peace. A remarkable amount of this poetry survives, having been collected during the era of the conquest. In some cases poetry is attributed to individual authors, such as Nezahualcoyotl, tlatoani of Texcoco, and Cuacuauhtzin, Lord of Tepechpan, but whether these attributions reflect actual authorship is a matter of opinion. Miguel Leon-Portilla, a well-respected Aztec scholar of Mexico, has stated that it is in this poetry where we can find the real thought of the Aztecs, independent of "official" Aztec ideology. It is also important to note that the Spanish classified many aspects of the Aztec/Nahuatl culture according to the lexicon and organizational categories with which they would distinguish in Europe. In the same way that the second letter of Cortez made a mention of "mesquitas", or in English, "mosques", when trying to convey his impression of Aztec architecture, early colonists and missionaries divided the principal bodies of nahuatl literature as "poetry" and "prose". "Poetry" was in xochitl in cuicatl a dual term meaning "the flower and the song" and was divided into different genres. Yaocuicatl was devoted to war and the god(s) of war, Teocuicatl to the gods and creation myths and to adoration of said figures, xochicuicatl to flowers (a symbol of poetry itself and indicative of the highly metaphorical nature of a poetry that often utilized duality to convey multiple layers of meaning). "Prose" was tlahtolli, also with its different categories and divisions (Garganigo et al). The Aztec people also enjoyed a type of dramatic presentation, a kind of theatre. Some plays were comical with music and acrobats, others were staged dramas of their gods. After the conquest, the first Christian churches had open chapels reserved for these kinds of representations. Plays in Nahuatl, written by converted Indians, were an important instrument for the conversion to Christianity, and are still found today in the form of traditional pastorelas, which are played during Christmas to show the Adoration of Baby Jesus, and other Biblical passages. Music and dance formed an essential part of the indigenous rites and ceremonies. Research about music of the Aztec people dates back to the writings of Bernal del Castillo, who was appalled by the music of these people because he viewed it during their ritualistic sacrifices, which were very different from rituals of Christian worship. Others, such as the Franciscan monk Fray Bernardino de Sahagun and the Dominican monk Diego Duran, were able to look at the music from different viewpoints, noting the unique instruments and the qualities of pitch and harmony that were achieved with these instruments - new sounds to their ears. Some musical instruments used are Tetzilacatl, Teponaztli, Tecomapiloa, Omichicahuaztli, Huehuetl, Coyolli, Chililitli, Caililiztli, Chicahuaztli, Cacalachtli, Ayotl, Ayacahtli, Tetzilacatl. The Aztec sculptures which adorned their temples and other buildings were among the most elaborate in all of the Americas. Their purpose was to please the gods and they attempted to do that in everything they did. Many of the sculptures reflected their perception of their gods and how they interacted in their lives. 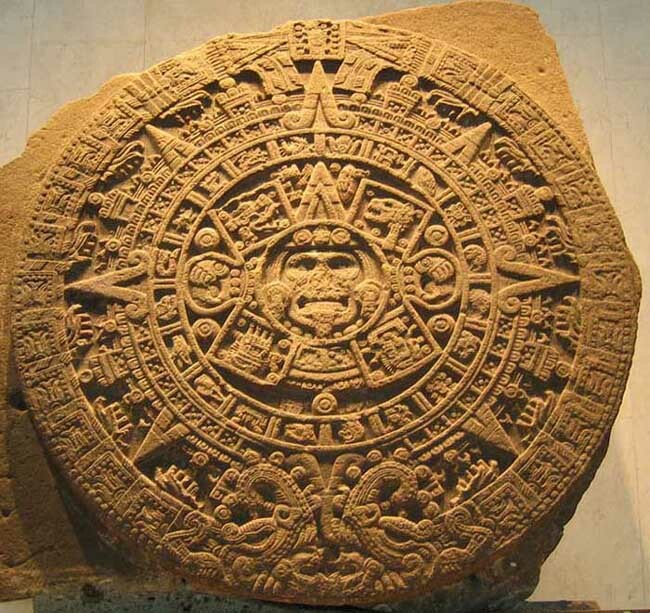 The most famous surviving Aztec sculpture is the large circular Calendar Stone, which represents the Aztec universe. In Aztec society, warriors, priests, and the nobility were considered to be among the most respected in the Aztecan social hierarchy Because of the Aztecs' emphasis on warfare, the warrior class was highly valued, and often warriors would volunteer for the most important Aztec sacrificial rituals. The long distance traders also enjoyed considerable privileges and often served the government as ambassadors and spies. The most outstanding artisans, physicians and truly wise teachers were also highly respected. The Aztec society was divided into 3 classes: slaves, commoners, and nobility. The highest class were the pipiltin or nobility. Originally this status was not hereditary, although the sons of pillis had access to better resources and education, so it was easier for them to become pillis. Later the class system took on hereditary aspects. The nobilities were the people who were nobles by birth, priests, and those who earned their rank. The very highest social sphere was occupied by a minority of families known as the pipiltin. These people were members of the hereditary nobility and occupied the top positions in the government, the army and the priesthood. The nobles chose a supreme leader known as the tlatoani from within their own group; in Nahuatl this name means he that speaks. This leader was greatly revered and ruled until his death. The second class were the 'macehualtin', originally peasants. Eduardo Noguera estimates that in later stages only 20% of the population was dedicated to agriculture and food production. The other 80% of society were warriors, artisans and traders. Eventually, most of the macehuallis were dedicated to arts and crafts. Their works were an important source of income for the city. The most numerous social group was known as the macehualtin; these people were engaged in agriculture and the common trades. Although they worked the land in family units and were allowed to kept their produce, the land itself was collectively owned by the inhabitants of the neighborhood or calpulli. Commoners were given lifetime ownership of an area of land. The lowest group of commoners were not allowed to own property. They were tenant farmers, they just got to use the land and never be owners. The lower social orders were made up by peasants, who like the European serfs, were attached to the lands owned by the nobility and were obliged to cultivate them in exchange for part of the harvest. Slaves or tlacotin also constituted an important class. Aztecs could become slaves because of debts, as a criminal punishment or as war captives. A slave could have possessions and even own other slaves. However, upon becoming a slave, all of the slave's animals and excess money would go to his purchaser. Slaves could buy their liberty, and slaves could be set free if they had children with or were married to their masters. Typically, upon the death of the master, slaves who had performed outstanding services were freed. The rest of the slaves were passed on as part of an inheritance. This slavery was very different from what Europeans of the same period were to establish in their colonies, although it had much in common with the slaves of classical antiquity. (Sahagun doubts the appropriateness even of the term "slavery" for this Aztec institution.) First, slavery was personal, not hereditary: a slave's children were free. A slave could have possessions and even own other slaves. Slaves could buy their liberty, and slaves could be set free if they were able to show they had been mistreated or if they had children with or were married to their masters. Typically, upon the death of the master, slaves who had performed outstanding services were freed. The rest of the slaves were passed on as part of an inheritance. Another rather remarkable method for a slave to recover liberty was described by Manuel Orozco y Berra in La civilizacion azteca (1860): if, at the tianquiztli (marketplace; the word has survived into modern-day Spanish as "tianguis"), a slave could escape the vigilance of their master, run outside the walls of the market and step on a piece of human excrement, and then present their case to the judges, who would grant freedom. They would then be washed, provided with new clothes not owned by the master, and declared free. Because a person who was not a relative of the master could be declared a slave for trying to prevent a slave's escape, people typically would not help the master prevent the slave's escape. Orozco y Berra also reports that a master could not sell a slave without the slave's consent, unless the slave had been classified as incorrigible by an authority. (Incorrigibility could be determined on the basis of repeated laziness, attempts to run away, or general bad conduct.) Incorrigible slaves were made to wear a wooden collar, affixed by rings at the back. The collar was not merely a symbol of bad conduct: it was designed to make it harder to run away through a crowd or through narrow spaces. When buying a collared slave, one was informed of how many times that slave had been sold. A slave who was sold four times as incorrigible could be sold to be sacrificed; those slaves commanded a premium in price. However, if a collared slave managed to present him- or herself in the royal palace or in a temple, he or she would regain liberty. An Aztec could become a slave as a punishment. A murderer sentenced to death could instead, upon the request of the wife of his victim, be given to her as a slave. A father could sell his son into slavery if the son was declared incorrigible by an authority. Those who did not pay their debts could also be sold as slaves. People could sell themselves as slaves. They could stay free long enough to enjoy the price of their liberty, about twenty blankets, usually enough for a year; after that time they went to their new master. Usually this was the destiny of gamblers and of old ahuini (courtesans or prostitutes). 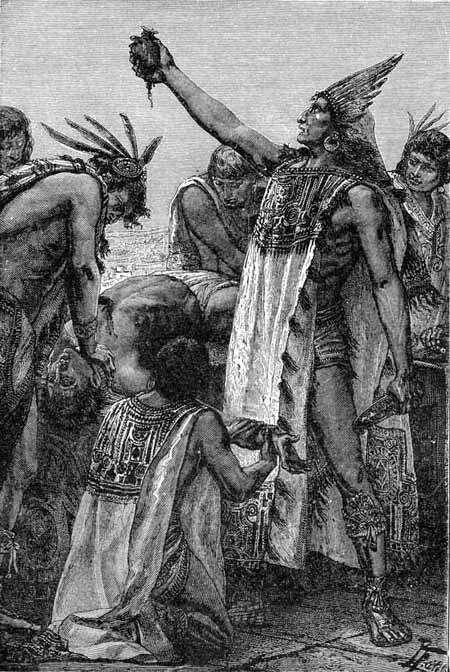 Motolinia reports that some captives, future victims of sacrifice, were treated as slaves with all the rights of an Aztec slave until the time of their sacrifice, but it is not clear how they were kept from running away. The children of poor parents could be sold, usually for only a certain time period. Slaves could buy back their freedom. Slaves that escaped and reached the royal palace without being caught were given their freedom instantly. Aztec codices are books written by pre-Columbian and colonial-era Aztecs. These codices provide some of the best primary sources for Aztec culture. The pre-Columbian codices differ from European codices in that they are largely pictorial; they were not meant to symbolize spoken or written narratives. 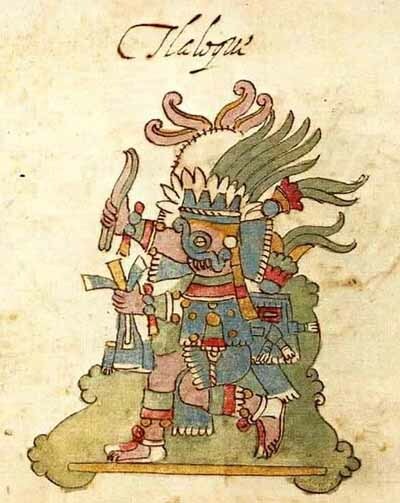 The colonial era codices not only contain Aztec pictograms, but also Classical Nahuatl (in the Latin alphabet), Spanish, and occasionally Latin. Although there are very few surviving pre-conquest codices, the tlacuilo (codex painter) tradition endured the transition to colonial culture; scholars now have access to a body of around 500 colonial-era codices. According to the Madrid Codex, the fourth tlatoani Itzcoatl (ruling from 1427 (or 1428) to 1440) ordered the burning of all historical codices because it was "not wise that all the people should know the paintings". Among other purposes, this allowed the Aztec state to develop a state-sanctioned history and mythos that venerated Huitzilopochtli. The principal food of the Aztec was a thin cornmeal pancake called a tlaxcalli. (In Spanish, it is called a tortilla.) They used the tlaxcallis to scoop up foods while they ate or they wrapped the foods in the tlaxcalli to form tacos. 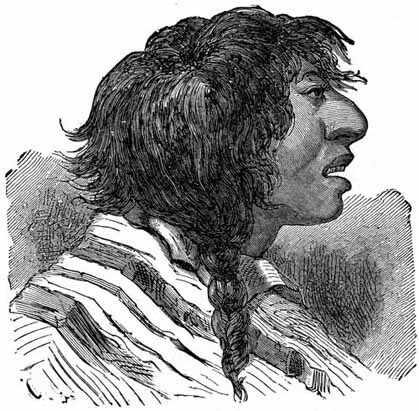 They hunted for most of the meat in their diet and the chief game animals were deer, rabbits, ducks and geese. The only animals they raised for meat were turkeys and dogs. The Aztecs have been credited with the discovery of chocolate. The Aztecs made chocolate from the fruit of the cacao tree and used it as a flavoring and as an ingredient in various beverages and kinds of confectionery. In 1519, Hernan Cortez tasted Cacahuatt, a drink enjoyed by Montezuma II, the last Aztec emperor. Cortez observed that the Aztecs treated cacao beans, used to make the drink, as priceless treasures. He subsequently brought the beans back to Spain where the chocolate drink was made and then heated with added sweeteners. Its formula was kept a secret to be only enjoyed by the nobility and the warrior class. The Aztec economy can be divided into a political sector, under the control of nobles and kings, and a commercial sector that operated independently of the political sector. The political sector of the economy centered on the control of land and labor by kings and nobles. Nobles owned all land, and commoners got access to farmland and other fields through a variety of arrangements, from rental through sharecropping to serf-like labor and slavery. These payments from commoners to nobles supported both the lavish lifestyles of the high nobility and the finances of city-states. Many luxury goods were produced for consumption by nobles. The producers of featherwork, sculptures, jewelry, and other luxury items were full-time commoner specialists who worked for noble patrons. In the commercial sector of the economy several types of money were in regular use. Small purchases were made with cacao beans, which had to be imported from lowland areas. In Aztec marketplaces, a small rabbit was worth 30 beans, a turkey egg cost 3 beans, and a tamal cost a single bean. For larger purchases, standardized lengths of cotton cloth called quachtli were used. There were different grades of quachtli, ranging in value from 65 to 300 cacao beans. One source stated that 20 quachtli could support a commoner for one year in Tenochtitlan. A man could also sell his own daughter as a sexual slave or future religious sacrifice, generally for around 500 to 700 beans. A small gold statue (approximately 0.62 kg / 1.37 lb) cost 250 beans. Money was used primarily in the many periodic markets that were held in each town. A typical town would have a weekly market (every 5 days), while larger cities held markets every day. Cortes reported that the central market of Tlatelolco, Tenochtitlan's sister city, was visited by 60,000 people daily. Some sellers in the markets were petty vendors; farmers might sell some of their produce, potters sold their vessels, and so on. Other vendors were professional merchants who traveled from market to market seeking profits. The pochteca were specialized merchants organized into exclusive guilds. They made lengthy expeditions to all parts of Mesoamerica, and they served as the judges and supervisors of the Tlatelolco market. Although the economy of Aztec Mexico was commercialized (in its use of money, markets, and merchants), it was not "a capitalist economy because land and labor were not commodities for sale." The Mexicas were especially interested in education. Boys and girls were carefully educated from birth. During the first years of life, fathers educated boys, while mothers took care of girls. Once family education was over, the children of the nobles and priests went to the calmecac, and all others went to the tepochcalli. The Aztecs believed that education was extremely valuable and insisted that boys, girls and young people attend school. There were two main types of school, the so-called tepochcalli and the calm-cac. Boys and girls went to both, but were kept separate from each other. The tepochcalli was for the children of common families and there was one in each neighborhood. Here, children learned history, myths, religion and Aztec ceremonial songs. Boys received intensive military training and also learned about agriculture and the trades. Girls were educated to form a family, and were trained in the arts and trades that would ensure the welfare of their future homes. The calmecac was for the children of the nobility, and served to form new military and religious leaders. Until the age of fourteen, the education of children was in the hands of their parents, but supervised by the authorities of their calpolli. Part of this education involved learning a collection of sayings, called huehuetlatolli ("sayings of the old"), that embodied the Aztecs' ideals. Judged by their language, most of the huehuetlatolli seemed to have evolved over several centuries, predating the Aztecs and most likely adopted from other Nahua cultures. At 15, all boys and girls went to school. The Mexica, one of the Aztec groups, were one of the first people in the world to have mandatory education for nearly all children, regardless of gender, rank, or station. There were two types of schools: the telpochcalli, for practical and military studies, and the calmecac, for advanced learning in writing, astronomy, statesmanship, theology, and other areas. The two institutions seem to be common to the Nahua people, leading some experts to suggest that they are older than the Aztec culture. 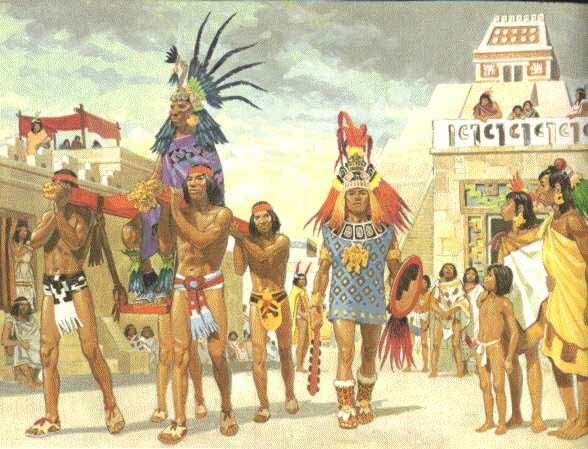 Aztec teachers (tlatimine) propounded a spartan regime of education with the purpose of forming a stoical people. Girls were educated in the crafts of home and child raising. They were not taught to read or write. All women were taught to be involved in religion; there are paintings of women presiding over religious ceremonies, but there are no references to female priests. In the context of the family, men and women played distinct roles. Aztec women married at about 16. In school boys were taught arts and crafts, and the girls were taught to cook and other necessities to raise a family. The Aztecs made terraces, which were steps descending down a hall to control the flow of water. This kept their crops from flooding. Like the Olmec civilization, the Aztecs also used a slash and burn method of farming. Chinampas, artificial islands made by weaving giant reed mats and covering them with mudded plants, were used to extend crops into the swamp. Although they seemed to float, the chinampas were anchored to the ground by plant roots. All this helped the Aztecs grow and abundance of corn, chili peppers, squash, tomatoes, beans, and other kinds of food. The Aztecs were late arrivals to the Lake Texcoco area. They were surrounded by very strong neighbors, so they were forced to live on the swampy, western side of the lake. As the Aztecs grew in number they made excellent military and civil organizations. By 1325, they founded the city of Tenochtitlan. The city was located on present day Mexico City. It was very hard to build Tenochtitlan because the Aztecs only had a small piece of land in the surrounding marshes. The Aztecs made the swampy, shallow lake into chinampas. In this case the islands were made by piling up mud from the lake bottom. They used them as their city foundations. Then they built causeways and bridges to connect the city to the mainland. To easily move people and goods, canals were dug and lined with stone. All this made it easy to defend the city from attack. Because of Tenochtitlan's location and high organization, the city grew rapidly. By 1519 there were about 60,000 people in the city every day. Goods were exported and traded in many other parts of the Aztec Empire. A game similar to handball was played by the northern and central Americans from 1500 B.C. most famously by the Aztecs as the Mesoamerican ballgame. None of these reference a rebound game using a wall, however, and these ancient games resemble a form of hand tennis. They were very competitive and didn't like to lose. The Aztec Empire was an example of an empire that ruled by indirect means. Like most European empires, it was ethnically very diverse, but unlike most European empires, it was more a system of tribute than a single system of government. In the theoretical framework of imperial systems posited by Alexander J. Motyl the Aztec empire was an informal or hegemonic empire because it did not exert supreme authority over the conquered lands, it merely expected tributes to be paid. It was also a discontinuous empire because not all dominated territories were connected, for example the southern peripheral zones of Xoconochco were not in direct contact with the center. The hegemonic nature of the Aztec empire can be seen in the fact that generally local rulers were restored to their positions once their city-state was conquered and the Aztecs did not interfere in local affairs as long as the tribute payments were made. Although the Aztec form of government is often referred to as an empire, in fact most areas within the empire were organized as city-states, known as altepetl in Nahuatl. These were small polities ruled by a king (tlatoani) from a legitimate dynasty. 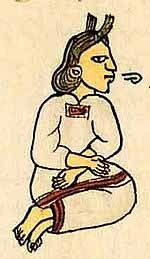 The Early Aztec period was a time of growth and competition among altepetl. Even after the empire was formed (1428) and began its program of expansion through conquest, the altepetl remained the dominant form of organization at the local level. The efficient role of the altepetl as a regional political unit was largely responsible for the success of the empire's hegemonic form of control. 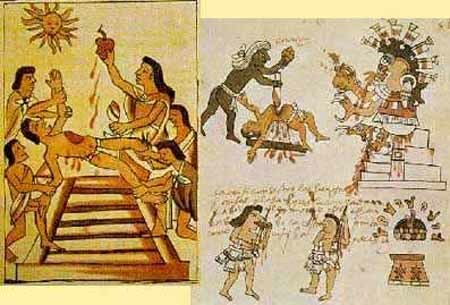 For most people today, and for the European Catholics who first met the Aztecs, human sacrifice was the most striking feature of Aztec civilization. While human sacrifice was practiced throughout Mesoamerica, the Aztecs, if their own accounts are to be believed, brought this practice to an unprecedented level. For example, for the reconsecration of Great Pyramid of Tenochtitlan in 1487, the Aztecs reported that they sacrificed 84,400 prisoners over the course of four days, reportedly by Ahuitzotl, the Great Speaker himself. 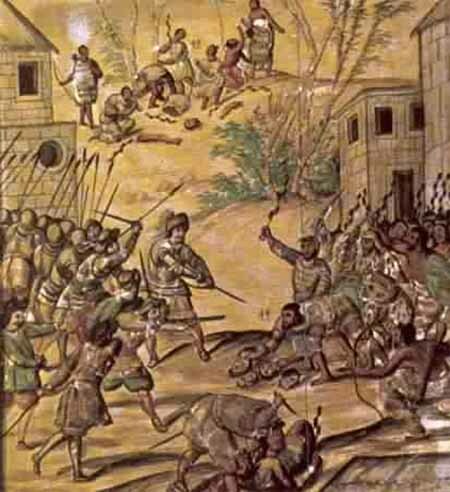 In the writings of Bernardino de Sahagun, Aztec "anonymous informants" defended the practice of human sacrifice by asserting that it was not very different from the European way of waging warfare: Europeans killed the warriors in battle, Aztecs killed the warriors after the battle. The Aztec spoke a language called Nahuatl (pronounced NAH waht l). It belongs to a large group of Indian languages which also include the languages spoken by the Comanche, Pima, Shoshone and other tribes of western North America. Nahuatl is a group of related languages and dialects of the Nahuan (traditionally called "Aztecan") branch of the Uto-Aztecan language family. Collectively they are spoken by an estimated 1.5 million Nahua people, most of whom live in Central Mexico. All Nahuan languages are indigenous to Mesoamerica. This early literary language based on the Tenochtitlan dialect has been labeled Classical Nahuatl and is among the most studied and best documented languages of the Americas. Today Nahuatl dialects are spoken in scattered communities mostly in rural areas. Variations of this language are still spoken in some of the more remote areas of Mexico in which the indigenous cultures are still alive. Nahuatl is a variation of a larger language group known as Uto-Aztecan. Other variations on this language group are still spoken in some of the regions spanning from central Mexico through northern Mexico on into the southwestern United States including the Pima, Tohono O'ohdam of Arizona. The Aztecs used a vigesimal system, counting by 20s. The numbers 1-19 were expressed by dots or occasionally by fingers; 20 was represented by a flag; 400 (i.e. 20 >(20) by a sign which looks like a feather or a fir tree; and 8,000 (20 x 20 x 20) by a bag or tasseled pouch which was imagined to contain 8,000 cocoa beans. Aztec religion combined elements of polytheism, shamanism and animism within a framework of astronomy and calendrics. 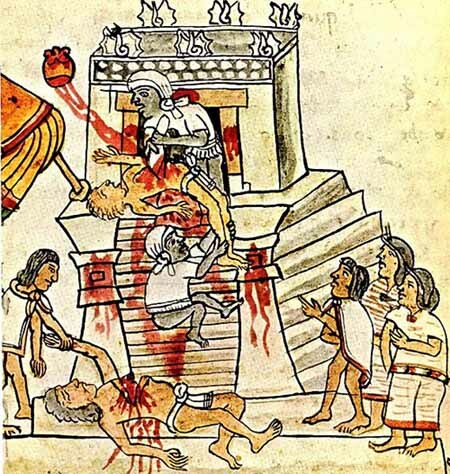 Like other Mesoamerican religions, it had elements of human sacrifice in connection with a large number of religious festivals which were held according to patterns of the Aztec calendar. It had a large and ever increasing pantheon; the Aztecs would often adopt into their own religious practice deities of other geographic regions or peoples. Aztec cosmology divided the world into upper and nether-worlds, each associated with a specific set of deities and astronomical objects. Important in Aztec religion were the sun, moon and the planet Venus - all of which held different symbolic and religious meanings and were connected to deities and geographical places. Large parts of the Aztec pantheon were inherited from previous Mesoamerican civilizations and others, such as Tlaloc, Quetzalcoatl and Tezcatlipoca, were venerated by different names in most cultures throughout the history of Mesoamerica. For the Aztecs especially important deities were Tlaloc the god of rain, Huitzilopochtli the patron god of the Mexico tribe, Quetzalcoatl the culture hero and god of civilization and order, and Tezcatlipoca the god of destiny and fortune, connected with war and sorcery. Each of these gods had their own temples within the Aztec capital Tenochtitlan - Tlaloc and Huitzilopochtli were both worshipped at the Templo Mayor. A common Aztec religious practice was the recreation of the divine: Mythological events would be ritually recreated and living persons would impersonate specific deities and be revered as a god - and often ritually sacrificed. Aztec philosophy saw the concept of teotl as a fundamental unity that underlies the entire universe. 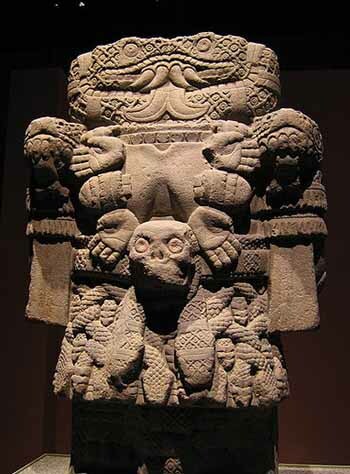 Teotl forms, shapes, and is all things. Even things in oppositio - light and dark, life and death - were seen as expressions of the same unity, teotl. The belief in a unity with dualistic expressions compares with similar dialectical monist ideas in both Western and Eastern philosophies. Aztec philosophy saw the arts as a way to express the true nature of teotl. 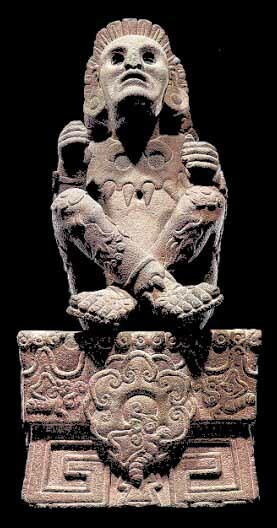 Art was considered to be good if it in some way brought about a better understanding of teotl. Aztec poetry was closely tied to philosophy and often used to express philosophic concepts. Precolumbian Aztec society was the highly complex and stratified society that developed among the Aztecs of central Mexico in the centuries prior to the Spanish conquest of Mexico, and which were built on the cultural foundations of the larger region of Mesoamerica. Politically the society was based around the independent citystate, called an "Altepetl", composed of smaller divisions called Calpulli, which were again normally composed of one or more extended kinship groups. Socially the society depended on a rather strict division between nobles and free commoners both groups which were divided into elaborate hierarchies of social status, responsibilities and power. Economically the society was dependent on agriculture and also to a large extent warfare, other economically important factors was commerce, long distance and local, and a high degree of trade specialization. Recreation was important. Prior to the fall of the Aztec, the Aztec people had a stable economy driven by a successful trade market. The markets, which were located in the center of many communities, were well organized and diverse in goods, as noted by the Spanish conquistadors upon their arrival. The regional merchants, known as tlanecuilo tended to barter utilitarian items and foodstuffs, which included gold, silver, and other precious stones, cloth and cotton, animal skins, both agriculture and wild game, and woodwork. The trade market of the Aztec people was not only important to commerce, but also to the socialization, as the markets provided a place for the people to exchange information within their regions. This type of trade market was used primarily for locally produced goods, as there was not much traveling needed to exchange goods at the market. With no domestic animals as an effective way to transport goods, the local markets were an essential part of Aztec commerce. However, the Aztec nobility obtained much of their merchandise from neighboring highland basins, distant places within the empire, and from land beyond the empire therefore creating the need for a long distance trade organization. The long distance trade was carried out by merchants called pochteca, who were defined by their positions within the system. These professional merchants occupied a high status in Aztec society, below the noble class. 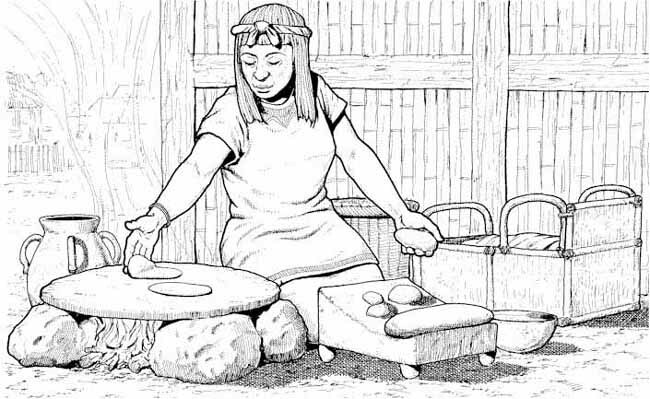 The pochteca were responsible for providing the materials that the noble class used to display their wealth. These materials were often obtained from foreign sources. Due to the success of the pochteca, many of the merchants became as wealthy as the noble class, but were obligated to hide this wealth from the public. The pochteca were an advanced group who reported to 12 locations throughout the Empire, where the high officials were located. 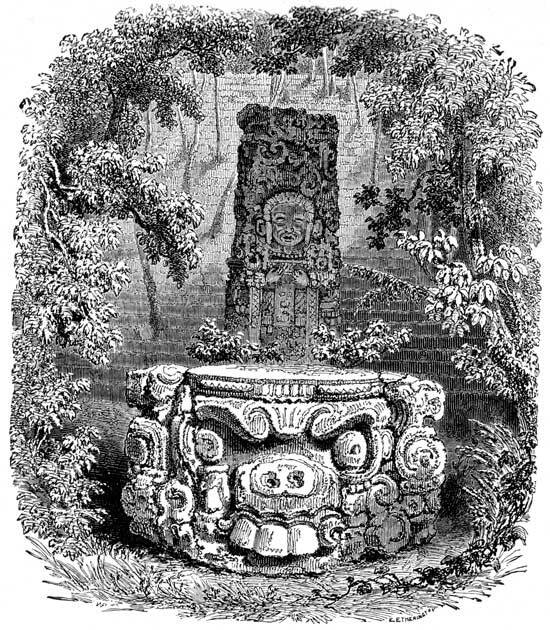 The highest officials of the pochteca were the pochtecatlatoque. The pochtecatlatoque were the elder of the pochteca, and were no longer travelers, but rather acted as administrators, overseeing young pochteca and administering the marketplace. 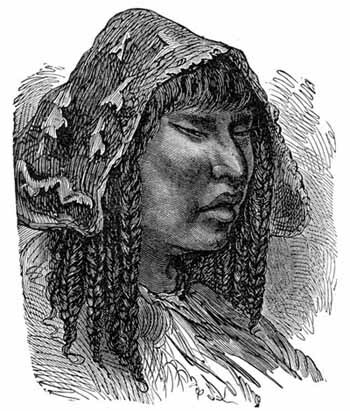 The second group of pochteca was the slave traders, known as the tlatlani. These people were often referred to as the richest of merchants, as they played a central role in capturing the slaves used for sacrificial victims. A group of trader spies, known as the naualoztomeca, made up the last group of pochteca. The naualoztomeca were forced to disguise themselves as they traveled, as they sought after rare goods. The naualoztomeca were also used for gathering information at the markets and reporting the information to the higher levels of pochteca. 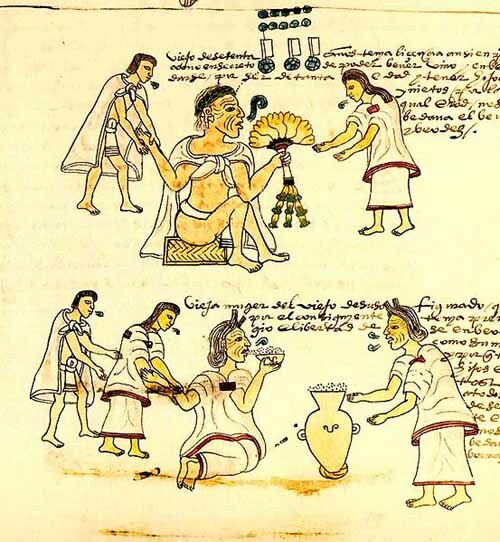 Several pages from the Codex Mendoza list tributary towns along with the goods they supplied, which included not only luxuries such as feathers, adorned suits, and greenstone beads, but more practical goods such as cloth, firewood, and food. Tribute was usually paid twice or four times a year at differing times. Archaeological excavations in the Aztec-ruled provinces show that incorporation into the empire had both costs and benefits for provincial peoples. On the positive side, the empire promoted commerce and trade, and exotic goods from obsidian to bronze managed to reach the houses of both commoners and nobles. Trade partners included the enemy Tarascan, a source of bronze tools and jewelry. On the negative side, imperial tribute imposed a burden on commoner households, who had to increase their work to pay their share of tribute. Nobles, on the other hand, often made out well under imperial rule because of the indirect nature of imperial organization. The empire had to rely on local kings and nobles and offered them privileges for their help in maintaining order and keeping the tribute flowing. The Aztecs had 3 basic crafts: metal work, feather work, and music. The metal workers had no iron so they used copper, gold, and silver. The main contribution of the Aztec rule was a system of communications between the conquered cities. In Mesoamerica, without draft animals for transport (nor, as a result, wheeled vehicles), the roads were designed for travel on foot. Usually these roads were maintained through tribute, and travelers had places to rest and eat and even latrines to use at regular intervals, roughly every 10 or 15 km. Couriers (paynani) were constantly traveling along those ways, keeping the Aztecs informed of events, and helping to monitor the integrity of the roads. Due to the steady surveillance, even women could travel alone, a fact that amazed the Spaniards, as that was not at all possible in Europe since the time of the Romans. After the conquest those roads were no longer subject to maintenance and were lost. Due to the aspirations of conquest and the religious beliefs of the Mexicas, war was a very important activity. The Mexicas believed that the gods had sacrificed themselves for mankind, that their blood had given man life, and that the Sun was nourished with the blood of human hearts. This belief led them to sacrifice many prisoners at their temples. Some people were able to resist the Aztecs; the most powerful of these were the Tlaxaltecas and the Purepechas. The people were completely prepared for war and great emphasis was placed on the creation of codexes and on the interpretation of the calendars, since both activities were essential to religion and community life. The codexes consist of writing and drawings made by the Mesoamerican people on strips of deer skin, or on a kind of paper made from amate tree bark. Once finished, these strips were folded like a concertina. Although there were surely a large number of codexes, only a few were conserved. Many were destroyed by the Spanish Conquistadors, and others were lost through neglect or due to the fragile materials on which they were created. The Aztec used pictographs to communicate through writing. Some of the pictures symbolized ideas and other represented the sounds of the syllables. They made paper by taking strips of bark from fig trees and pounding it on hard pieces of wood. The administration of Tenochtitlan and its foreign provinces required a great deal of paperwork. Taxes had to be collected, lawsuits between villages or private individuals had all to be recorded, and the merchants kept accounts of their goods and profits. Instructions and reports passed to and fro between the capital and the outlying cities, and like any civilized people of today the Mexicans were familiar with both red tape and official correspondence. The clans maintained land registers, and when Cortes reached Tenochtitlan he had no trouble in procuring from the royal archive a map showing all the rivers and bays along a 400-mile stretch of the north coast. In addition each temple owned a library of religious and astrological works, while a large private household, like that of Moctezuma, employed a full-time steward to look after the accounts which were so many that they filled an entire house. Ixtiuxochiti, a brother of the last native ruler of Texcoco, has left this account in the prologue to his Historia Chichimeca. They had scribes for each branch of knowledge. Some dealt with the annals, putting down in order the things. which happened each year, giving the day, month, and hour. Others had charge of the genealogies, recording the lineage of rulers, lords and noblemen, registering the newborn and deleting those who had died. Some painted the frontiers, limits, and boundary markers of the cities, provinces and villages, and also the distribution of fields, whose they were and to whom they belonged. Other scribes kept the law books and those dealing with the rites and ceremonies which they practiced when they were infidels. The priests recorded all matters to do with the temples and images, with their idolatrous doctrines, the festivals of their false gods, and their calendars. And finally, the philosophers and learned men which there were among them were charged with painting all the sciences which they had discovered, and with teaching by memory all the songs in which were embodied their scientific knowledge and historical traditions. In the law courts, especially those dealing with land and property rights, the disputants supported their claims with genealogies and maps, showing the king's land in purple, the lords' in red, and the clan fields in yellow. Of this mass of paperwork hardly anything remains, and nearly all the surviving books from the Aztec homeland are of post-Conquest date. Some are copies of earlier works, while others are written in Aztec script with Spanish or Nahuati commentaries in European letters. The best collection of preConquest books comes from Oaxaca, the land of the Mixtecs, where more than a dozen examples have been preserved. Each book, or codex, consists of a strip, anything up to 13 yards in length and some 6-7 inches high, made of paper, maguey cloth, or deer skin, and folded in zigzag or concertina fashion like a modern map, so that wherever the user opened it he was confronted by two pages. The ends of the strip were glued to thin plaques of wood which served as covers and were some-times decorated with paintings or with discs of turquoise. Both sides of the strip were covered with writing and pictures, and the individual pages were divided into sections by red or black lines. Each page was normally read from top to bottom, though in some codices the arrangement is zigzag or even goes around the page. The strip was scanned from left to right. This enormous production of documents was dependent on a steady supply of the raw materials, and each year 24,000 reams of paper, the equivalent of 480,000 sheets, were sent to Tenochtitlan. Aztec paper was made from the inner bark of various species of fig tree. The bark was soaked in a river or in a bath of limey water, and the fibers were separated from the pulp, then laid on a smooth surface, doubled over, and beaten with a mashing stone which had a ridged surface. A binding material (probably a gum of vegetable origin), was added, and the fibers were beaten out into a thin, homogeneous sheet. After smoothing and drying, the processed bark fibers had recognizably become paper, but the surfaces were still porous and rough, unsuitable for painting until they had been given a coating of white chalky varnish or size. On this background the scribe drew his figures, first sketching the outlines in black, then adding the colors with his brush. The principal colors were red, blue, green, and yellow, and the pigments were sometimes mixed with an oil to give added luster. Scribes were respected craftsmen, and the profession was probably hereditary. The Aztecs wrote using symbols similar to the characters used by the Chinese and Japanese. All the symbols were pictures of one kind or another. The symbols can be thought of as ideograms in which the objects express their own natures but also the underlying ideas and not concepts associated with them. Thus the idea of death can be represented by a corpse wrapped for burial, night by a black sky and a closed eye, war by a shield and a club, or speech by a little scroll issuing from the mouth of the person who is talking. Concepts involving the idea of motion, walking, migration, or the sequence of events were usually indicated by a trail of footprints going in the necessary direction. Aztec personal names were of the descriptive type which could usually be written in glyphs. The name of the Emperor Acamapichtli means 'Handful of Reeds' and his glyph is a forearm with the hand grasping a bundle of stalks. 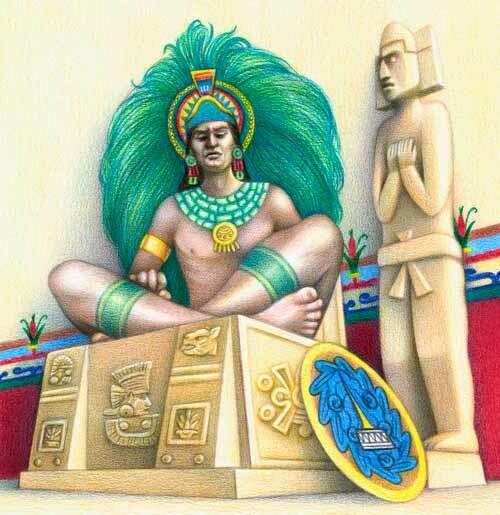 Chimalpopoca, the name of the next ruler but one, means 'Smoking Shield', and his successor was Itzcoatl or 'Obsidian Snake'. There was also a phonetic element in Aztec writing. Every word in spoken language has a sound as well as a meaning, and glyphs were sometimes used to indicate the phonetic value of a word rather than its sense. Thus, to give an example from English, a drawing of an eye may be a pictogram (meaning the eye as part of the body), or an ideogram (expressing the idea of sight and vision), or a phonogram (standing for the sound 'I'). In the latter case, the eye symbol can be used, as a sort of pun, to indicate the first person singular. It is possible to write the sentence, 'I can be hospitable', as a series of phonetic glyphs: an eye, a tin can, a bee, a horse, a pit or hole, and a table. The Aztecs applied the same technique to the writing of Nahuatl. Pictures were sometimes used for their sound, without reference to their meaning. The symbol for teeth (tiantli in the Aztec language) expressed the syllable 'tlan'; the glyph or tree or forest (quauill) stood for the syllable 'quauh', a stone (tell) for 'te', a mountain (tepeti) for 'tepe', and so on. Vowels were sometimes represented phonetically; the sound 'a' by the symbol for water (all), or '0' by a road (olli). Names of towns could be expressed by a combination of such phonograms. 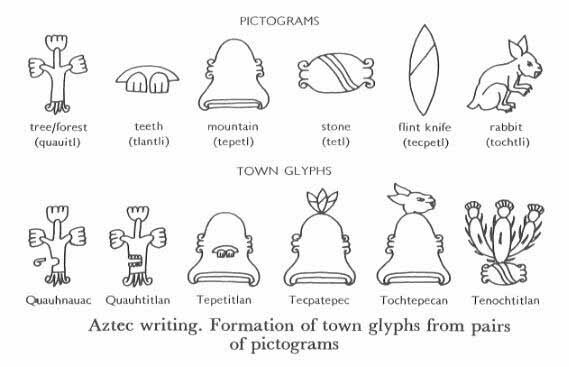 The sign for the Aztec capital, Tenochtitlan, was a stone (tell) from which sprouted a prickly pear cactus (nochili); Tochtepecan was indicated by a rabbit (tochtli) above a mountain (tepeti); quauhtitlan by a tree (quauitl) with teeth (tiantli), quauhnauac by a tree with a speech scroll issuing from it (nahuall -speech). These symbols were not placed in sequence, one after the other like the letters and words in a book, but formed part of a larger composition which often took the form of a scene in which many things may be happening at once. An Aztec manuscript is not read in the normal sense of the word, but is deciphered like a puzzle picture in which the glyphs provide. labels and clues to what is going on. The lower part of the picture generally represents the ground, while the upper is the sky. Since the Aztecs had not discovered the rules of perspective, distance is shown by placing the furthest figures at the top of the page and the nearest at the bottom. Relative importance is indicated by size: a victorious king, for example, may be drawn larger than his defeated enemy. All figures are in profile, with no three-quarter views or fore-shortening. Every item in a composition is there to give information, either directly or by implication, and the painter assumes that the person examining the document is familiar with the insignia of rank, the costumes appropriate to the various classes, and the iconography of the different gods. A priest, for instance, is always depicted with his face painted black, his hair long, and his ear-lobe stained red from blood-letting. He can thus be recognized as a priest even when dressed in warrior 5 costume or plain garb. In the same way, an old person can be recognized by the lines which represent the wrinkles on his face. Color was also important. The signs for grass, canes, and rushes look very much the same in black and white, but in color there could be no mistake: in the Codex Mendoza grass is yellow, canes are blue, rushes green. A ruler could be recognized at once from the shape of his diadem and from its color, turquoise, which was reserved for royal use. A scribe who could keep pace with court proceedings had every reason to be proud of his skill Aztec. Both writing and reading were therefore specialized skills, and it is no wonder that the mass of the population remained illiterate. Writing was not taught in the schools attended by plebeian children, and indeed the ordinary man would have no need for it. In a bureaucratic and centralized society the common man received his instructions from above, from the priests who looked after the religious side of his life, or from the secular officials who were drawn from the nobility and had the benefit of a calmecac education. Most modern day Mexicans (and people of Mexican descent in other countries) are mestizos, of mixed indigenous and European Spanish ancestry. During the 16th century the racial composition of Mexico began to change from one that featured distinct indigenous (Mexicas and members of the many other Mexican indigenous groups) and immigrant (mostly Spanish) populations, to the population composed primarily of mestizos that is found in modern day Mexico. The Nahuatl language is today spoken by 1.5 million people, mostly in mountainous areas in the states of central Mexico. Local dialects of Spanish, Mexican Spanish generally, and the Spanish language worldwide have all been influenced, in varying degrees, by Nahuatl. Some Nahuatl words (most notably chocolate and tomato) have been borrowed through Spanish into other languages around the world. Mexico City was built on the ruins of Tenochtitlan, making it one of the oldest living cities of America. Many of its districts and natural landmarks retain their original Nahuatl names. Many other cities and towns in Mexico and Central America have also retained their Nahuatl names (whether or not they were originally Mexica or even Nahuatl-speaking towns). A number of town names are hybrids of Nahuatl and Spanish. Mexican cuisine continues to be based on and flavored by agricultural products contributed by the Mexicas/Aztecs and Mesoamerica, most of which retain some form of their original Nahuatl names. The cuisine has also become a popular part of the cuisine of the United States and other countries around the world, typically altered to suit various national tastes. The modern Mexican flag bears the emblem of the Mexica migration legend. Mexico's premier religious icon, the Virgin of Guadalupe has certain similarities to the Mexica earth mother goddess Tonantzin. For the 1986 FIFA World Cup Adidas designed the official match ball to show in its "triades" Aztec architectural and mural designs. Laurette Sejourne, a French anthropologist, wrote about Aztec and Mesoamerican spirituality. Her depiction of the Aztecs as a spiritual people was so compelling that new religions have been formed based on her writings. Some parts of her work have been adopted by esoteric groups, searching for occult teachings of the pre-Columbian religions. Sejourne never endorsed any of these groups. Miguel Leon-Portilla also idealizes the Aztec culture, especially in his early writings. Others, such as Antonio Velazco, have transformed the writings by Sejourne and Leon-Portilla into a religious movement. Antonio Velasco Pina has written three books, Tlacaelel, El Azteca entre los Aztecas, La mujer dormida debe dar a luz, and Regina. When mixed with the currents of Neopaganism, these books resulted in a new religious movement called "Mexicanista". This movement called for a return to the spirituality of the Aztecs. It is argued that, with this return, Mexico will become the next center of power. This religious movement mixes Mesoamerican cults with Hindu esoterism. The Mexicanista movement reached the peak of its popularity in the 1990s.